Today I’m not interviewing an author, but an artist. Lexi Sargeant is a graphic designer turned photographer whose life changed two years ago when she was diagnosed with a brain tumour. Lexi’s work focuses on showcasing the beauty in daily Australian life. 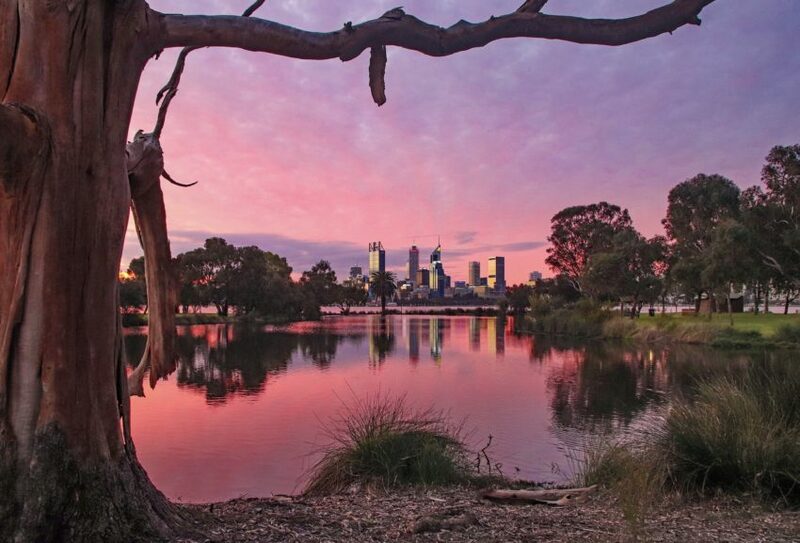 Her photos of suburban landscapes and Perth beaches have a sublime feel to them as her use of colour highlights the magic of the natural world, even in the middle of a large metropolitan city. Her instagram page is a wonderful contrast of urban architecture, landscapes and people. I wanted to interview Lexi for this blog to get some insight into her strength and how she manages to continue to develop and showcase her skills, even in the face of the daily symptoms she has to battle and overcome. There are times where I have wanted to give up. Lexi uses her Instagram account to openly share how she struggles with a brain tumour. Her strength is contagious. I’ve been struggling to go back to my novel after losing so much work early this year. Let Lexi’s story bring you back to your passion the way it has for me, whatever that passion might be. Lexi currently has a GoFundMe page to help her raise funds for brain surgery over in Sydney. I can’t imagine being in a position where the only treatment left is too expensive to be an option. Please donate. You won’t just be giving money. You’ll be giving hope. Tell us a bit about your design and photography work. How did you come into this field? Which do you favour? My passion progressed naturally from painting, to digital artwork, to photography. Photography was always something I “just did” in the background. I never saw it as a potential career path! I hit a real rough patch after high school and my mum was like, “I’ve enrolled you into Art School at Tafe”. It was the best thing she’s ever done for me. I loved it. Studying and working in Design taught me about balance, clean space (K.I.S.S – Keep It Simple Stupid) and how to use Adobe editing programs (including Photoshop). I kind of deviated from Visual Arts because I began to enjoy computer art more and saw Design as a more promising career path. Funnily enough, I always chose Photography electives at Tafe/University and it sets my heart on fire, so yes, I do favour it these days! Nowadays, I value artists as a whole – free spirits, writers and travel photographers. My main influences actually come from travel accounts like @Australia at the moment. I also follow a lot of amazing Photographers on Instagram! You photograph a lot of sunsets and a lot of water. Is there anything in particular that draws you to these? You had to give up your full time job as a Marketing Manager when you were diagnosed with a brain tumour. Are you still working in design and photography now? If so, how has your diagnosis changed the kind of work take on? If not, what role does design play in your life now? My diagnosis changed my work situation completely. I had to give up the 9-5 grind, but I gained the freedom to follow my passions as a freelancer. In a sense, I am grateful, because now I get to focus on my own dreams, instead of other peoples. I’ve been lucky enough to collaborate with a local Real Estate company over the last year or so. Funnily enough, I never considered this as a market, but was approached by a few Real Estate Agents on Instagram, which is nice. I have also been in discussions with a local council about doing a photography exhibition and fundraiser soon! How has your practise changed since diagnosis? Do you find you have more of less time to work and create? Has the kind of work you’re creating changed? Both. I have more time in the sense that I’m not working full time anymore, but I have less time because I’m focusing on my health and dealing with symptoms. The biggest strain on my practice is the lack of energy, migraines and medical appointments. I found it tougher to create after brain surgery and radiation but I still pushed myself to do it. Creating is cathartic for me. I’d be lost without it, so I always slot in a few days per week where I take out my camera, no matter how lethargic I feel! You have a gofundme page for your treatment running at the moment. What have you been through so far and why is raising this money so important? I’ve been through one major brain surgery, 7 weeks of radiation and countless MRI’s/appointments! The tumour is still considered incurable and sits at 2.7cm wide. My neurosurgeon in Perth is not prepared to operate any further, due to risks, and the location of the tumour (being wrapped around the carotid artery, which supplies blood to the brain). The neurosurgeon who I’m fundraising to go and see in Sydney, Dr Charlie Teo, is famous for offering hope to those with incurable tumours. He wouldn’t be prepared to remove all of it (due to one section of the tumour encasing the carotid artery), but there is potential for more brain surgery. That’s new hope that I didn’t have before. The only road block at the moment is funds. Travelling and consultations are incredibly expensive. I’ve been quoted over $120,000 for appointments and surgery, which is money I don’t have (that’s not including flights and accommodation, of course!). I decided to reach out to my social media followers in the hope that small donations will make this dream more achievable. What is life like with a brain tumour? What kinds of symptoms do you experience? It’s testing at times, but I feel stronger as a person and I have learnt a lot about myself and what I consider important. I experience daily headaches and migraines, concentration issues, memory loss, visual disturbances (flashes across the eyes, which worsen with migraines), low energy, tinnitus (ringing in the ears) from radiation, reduced motivation from depression/anxiety, and sometimes dizziness. You’ve mentioned before that photography helps you stay positive. What is it about this format that helps you? The whole experience is positive for me – adventuring out into nature, finding new compositions, improvising, being occasionally photobombed by animals and being constantly surprised! I learn a lot through trial and error, plus it keeps me motivated and distracted because I feel passionate about it. The editing process is also really enjoyable for me – sometimes I lighten the shadows and edit out distracting objects, e.g. tree branches or litter. I like to keep the photos as natural as possible so I never edit IN objects or make composites. I can appreciate artists who do this, but I choose not to :). Sharing creative work is always scary. You use instagram to not just share your work, but your brain tumour journey as well. What has that experience been like for you? Amazing – I’m overwhelmed by the support that I’ve received from complete strangers. Sometimes when I’m having an “off day”, I’ll receive a message from someone who says “you inspire me” or “keep going” and it helps me to believe again. People don’t realise the funks they’ve pulled me out of, just by existing and sending messages of support and encouragement. Most of my GoFundMe donations have been from complete strangers or “Instagram friends”, which is incredibly touching. I even received two donations equaling $320 from a generous Instagram follower – someone I’ve never met in person! To be honest, I’m incredibly grateful to those who’ve donated $5. Every little bit counts! What has this journey been like emotionally? How did you feel after diagnosis and how has that changed? It has been draining and scary, yet empowering, when I remember how much I’ve been through over the past two years. I was shocked and devastated after diagnosis, but eventually that turned into me seeking answers and researching more traditional remedies, like radiation and chemotherapy, as well as natural ones such as diet changes, reducing sugar, chewing raw Frankincense, essential oils, and even CBD oil. I never went through with CBD oil because it would impair my ability to drive, but it’s an interesting topic, and it’s still an option for the future. It still hasn’t completely sunk in, but I’ve certainly adjusted to my new life and set new goals (such as seeing Dr Teo and pursuing my photography). What message are you hoping to send through your work? Why is this important to you? There’s always beauty, no matter what you’re going through. I also want to remind people that we live in a beautiful place, but we get so caught up in our lives and the familiarity, that we don’t always see it. Raising brain tumour awareness has also become a passion of mine. I had no idea what a brain tumour and treatment REALLY was, until I found out that I have one. For example, I didn’t really know the difference between radiation and chemotherapy. I didn’t know that people only lose hair depending on what dosage/treatment they’re on. I had absolutely no idea how many types of tumours there are. I only knew about stories that I saw on the news. It’s important for me to show “a day in the life” by being completely honest about my experiences and the roller coaster of emotions! I know this can be a hard thing to think about, but what kind of future are you hoping for? What does it look like, sound like, smell like etc..? Who is there with you and what role does your creative practise have? The word “love” springs to mind. I don’t want to live with regrets. I want peace and simple living, but I also want atmosphere, fun, adventures and to be surrounded by people who care. I will continue taking photos. One of my dreams is to buy a drone and take this creativity to the next level! And…I hope there is a cure for rare brain tumours in my lifetime; who knows! You can follow Lexi’s journey on Instagram and donate to her GoFundMe campaign here. Every dollar counts.